Quote Reply Topic: Boom bolt problem, any ideas? 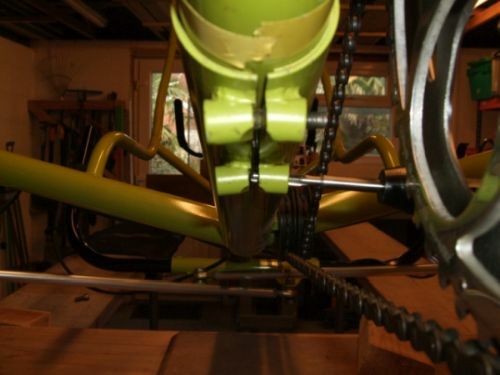 In doing winter maintenance on my Greenspeed trike, I've found that the boom bolt mounts are out of line . When i wondered why the cap screw was so tight, it became apparent that the screw thread was having to bend in the middle between the two bosses and had actually sheared. The front bosses are just about ok as the bolt seems fine but the rear one is going to need some attention. 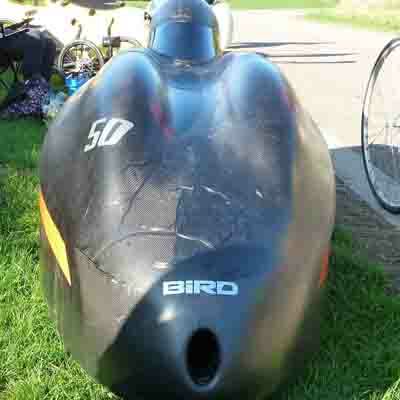 In this photo you can see the M6 tap is inclined to the horizontal as is the opposite one. I have no idea how they managed to weld them on like this AND get the bolt in in the first place. I tried threading in a longer bolt and wouldn't even start never mind cross thread. Maybe they welded it on with the bolt in place and the heat bent it? 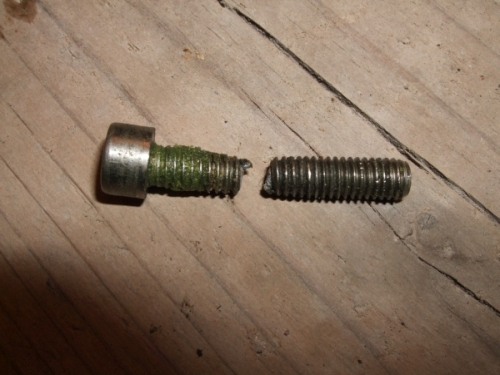 Here is the removed screw and the thread pitch varies due to the stretching it endured before failing. Because of this pitch issue, it was very reluctant to remove. The thread in the boss is fine though. I thought about drilling the thread end out and just use a longer bolt with a washer and nyloc but this would need tapered washers or shims so the face load is even. It also prevents future re-siting of the bosses to inline. I did wonder about trying to remove one of the bosses and get someone to weld it back on as i have no facilities for this but does any one have any other ideas? I'm a bit wary of grinding the boss off as it won't leave much meat for re-attaching. Would probably mean a new boss? It could be that the metal has stretched radially, from the bolt tension, which would misalign the bosses. Thanks Geoff, I think you are correct. It's looking like it has been overtightened in the past and by using a bolt in the threaded end to push against a chisel blade between the two bosses, I've been able to get them better aligned. Will still need to run a tap through but it's a hell of a lot nearer than it was.